Rhytidophyllum is a member of the subtribe Gesneriinae, a monophyletic lineage that has diversified in the Caribbean and is comprised of approximately 65 species. The genera of subtribe Gesneriinae include Gesneria (26 spp. ), Bellonia (2 spp. ), Pheidonocarpa (2 spp. ), and the rest belong to Rhytidophyllum. The majority of Rhytidophyllum are found on the islands of Cuba and Hispaniola. There are only two species that are non-Caribbean and they are located along the coasts of Colombia and Venezuela. These two species are: Rhytidophyllum onacaense (Rusby) L.E. Skog (mostly found in Colombia) and Rhytidophyllum cumanense (Hanst.) L.E. Skog (mostly found in Venezuela). Recent generic boundaries in the tribe Gesnerieae were confusing because Wiehler (1983) and Skog (1976) had different generic concepts for circumscribing Rhytidophyllum and Gesneria. Wiehler recognized Rhytidophyllum as a synonym of Gesneria and therefore combined all Caribbean members of the family into Gesneria. 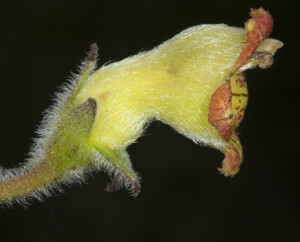 In contrast, Skog recognized Gesneria and Rhytidophyllum as separate genera by the presence of trichomes on the stamens as well as adnation of the stamens to the corolla tube. Phylogenetic data supports the spearationg of these two genera and all recent studies retain Rhytidophyllum and Gesneria as separate genera. Rhytidophyllum are distinguished from Gesneria by large bullate or areolate leaves, campanulate flowers, isolated stomata raised on domes, stamens adnate to the base of the corolla, pubescence on the stamen filaments, and maroon to green flowers. Only three species of Rhytidophyllum have red tubular flowers and have thus been historically classified as Gesneria but they exhibit adnation of the stamens at the base of the corolla tube and pubescence on the stamens, which is more similar to Rhytidophyllum.